A dowry may have been what was required to meet with some potential suitors. At times, advertisers for potential marriage partners stated their assets and asked for specific goods (money, a home, etc.) that the potential bride had to bring in return. A popular assistance was a love matchmaking service who placed ads to attract clients. The cost might have been only 2 cents (about 58 cents in today’s money), to receive a “long list” of names. 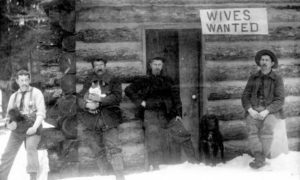 Newspaper advertisements became very popular as more single men traveled west looking for adventure or to try their hand at homesteading, and women found they were widowed or unable to find a mate after the Civil War with over 620,000 men died during the war. People did need to seek possible spouses outside their hometowns. Mail order brides were very popular during this time. If you have never sought out how your ancestors met, this could be a fascinating journey. Even if an ancestral couple grew up as childhood friends, that can still add an interesting twist to your family history. Example, my parents were both serving in the military, one in the US Army and one in the US Air Force. After voting on election day in 1948, mutual friends arranged for them to meet for breakfast. They were married within 6 months. 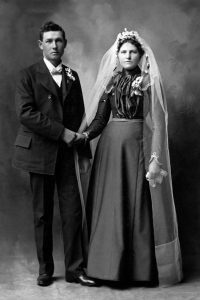 Photos: A couple just married; men of Lake McDonald requiring brides in 1901, and an ads from Nashville Union and American (Nashville, TN), November 23, 1855.